Commander John Rodgers in whose name Rodgers Airport is being dedicated today, lived a life that lent luster to the annals of U.S. naval achievement. He was born January 15, 1881 in the District of Columbia; and died August 27, 1926 as the result of a flying accident over the Delaware river, Pennsylvania, his plane falling into the river at the end of a flight from Washington. Commander Rodgers carried on the tradition of a long-distinguished American naval family, entering the naval academy on September 9, 1899, having been appointed at large. While at the naval academy he played football, rowed on crew and was a splendid all around athlete. Commander Rodgers’ father was John Augustus Rodgers, rear admiral (retired) U.S. navy, who was born at Havre de Grace, Maryland on July 30, 1862. Commander Rodgers’ brother is still living and both parents were in Honolulu for a couple of months about a year ago visiting their son, who was at that time in command of the naval air station, Pearl Harbor. John Rodgers’ grandfather was a capable naval officer and Commander Rodgers’ great grandfather was the celebrated John Rodgers, who was in the command of the President, with ranks of commodore and so distinguished himself in the War of 1812. Lieut. Comdr. John Rodgers was advanced to the rank of commander on November 4, 1920 and on January 1 of this year, after his history-making flight in the PN-9 No. 1 to these islands, he was assigned to duty as assistant chief of the Bureau of aeronautics. On June 19, 1926, he was selected for advancement to the rank of captain in the navy. He commanded the PN-9 No. 1, which tried to fly from San Francisco to Honolulu in 1925 and got within 200 miles of this port. Gasoline gave out, the vessel had to take to the water, and drifted for nine days. Rodgers’ leadership brought the plane and crew safely through, after four days of hardship. His cousin Earl was the first person to fly across the mainland United States for the Hearst trophy of $50,000. Commander Rodgers was the advance agent for his cousin. The plane cracked up in Long Beach, just before it had crossed the shore line, and it will be remembered that the Hearst trophy was not awarded due to the plane not having actually crossed the shore line. Glenn Curtiss, aviation pioneer taught Commander Rodgers to fly at San Diego in 1910-1911, on North island where the naval air station now stands. At that time neither the army nor the navy were based on the island. What is now the Rockwell Field intermediate air depot was at that time just a good hunting ground for rabbits. During his course of instruction under Glenn Curtiss, at North island, and while Rodgers was instructing another student, a crash occurred that buried Rodgers in the ground up to his shoulders. He was flying in a land-plane at the time. At the time of his death, Rodgers was the senior naval aviator in the U.S. service and had been flying since 1910. After his course with Glenn Curtiss, he flew for several years, and then returned to the regular line of the navy, where he remained until approximately 1920 when he returned to aviation duty. His career was a varied one much more so than the average naval officer. He had 16 years of sea service to his credit, embracing command of a surveying ship for a number of years in the West Indies, command of a submarine division base of the Canal Zone for a number of years; command of the mine-sweeping detachment which swept the northern mine barrage in the North Sea, during 1919. He was executive officer of the USS Nevada and developed mass singing there with the band, in connection with moving pictures in the evening. Commander Rodgers was in command of the Pearl Harbor naval station from September 1, 1922 to May 1925. While at this station he specialized in aerial navigation which was of great benefit to aviation then and now. While in Hawaii he became adept with the surfboard, and strongly recommended it to his aviators as being excellent sport and great for developing a proper sense of balance. At Lahaina, Commander Rodgers took his exercise on a surfboard towed behind a power boat, the tow-line being held in his hands. At the time of his death, he had just left the post of assistant chief of the bureau of aeronautics, to take command of an experimental long distance scouting squadron and his trip to Philadelphia, which ended so disastrously, was for the purpose of inspecting new planes assigned to his squadron. 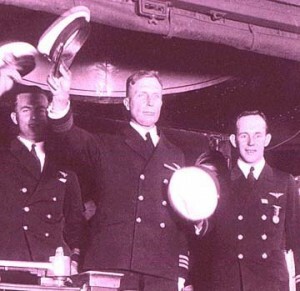 Commander Rodgers had not only specialized in this aerial navigation and made great improvement therein, but had instructed all of his officers in the subject. The instruments that he perfected while at Pearl Harbor, and in which he trained his officers, were taken with him, were his own developments, and were used in the trans-Pacific flight. Commander John Rodgers was distinguished for his courage, imperturbability, taciturnity and tenacity of purpose. He was a firm disciplinarian, and a man of excellent judgment. He was also a man of vision, especially in regard to naval aviation, in which he was 10 years ahead of his time. Rodgers had nerves of steel and was noted throughout the navy for apparent complete lack of fear. Many stories of his capacity to endure pain are recounted. It is said that on one occasion at Pearl Harbor his index finger was badly mangled. He was laid on an operating table while physicians worked on it. The pain was terrific but Rodgers was given neither a local nor general anaesthetic. In spite of this, the story goes, he went to sleep while the doctors were repairing the injured member.